For generations, the type of apparel, jewellery and accessories that any person wears has mirrored their personality, lifestyle and culture. Whether it is traditional sari, ghagra choli or dhoti, or modern wears like casuals & formals, over the years Indians have redefined real-world fashion in front of the world stage. Through their multicultural social bonds, they have presented some classy high-end fashions, which have influenced many fashion designers around the world. The key role behind the success of the Indian fashion industry has obviously been played by game changing fashion designers like Sabyasachi Mukherjee, Manish Malhotra, Anita Dongre and many more design personalities. Their eye catching designs have allowed the fashion industry to blossom and create a prime impact in customer specific production. Fashion education started in India long back in 1854, when the first ‘School of Industrial Art’ was founded at the City of Joy, Kolkata, that was followed by the inception of Sir JJ School of Arts in 1857 at the City of Dreams, Bombay (now Mumbai). The establishment of these institutions initiated the journey of the Indian fashion industry. Since then, the fashion education has crossed many hurdles and today a career in this industry is considered as one of the most challenging and exciting one. Designing education at present has become tougher and tougher due to the demands of every day new trends. At present, the fashion education sector is imparting some competitive professional skills. In addition to designing and crafting, these days’ students of fashion technology get a chance to learn planning & production, merchandising & marketing of quality textiles. It can be said that the Indian fashion industry has maintained the culture and tradition with an integration of new booming methods, which has increased its global exposure. Back in the early days, Indians used their hand for sewing and designing distinct thread patterns, which is known as ‘Embroidery’. This used to give a traditional outlook on the garments. Nowadays, the new day designers merge this traditional look with European ethnics to give a ‘western-culture’ picturesque on different apparels. Apparently, the education imparted in various fashion colleges has created this ‘New Fashion Statement’. 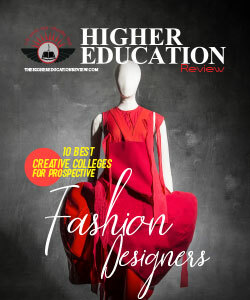 Welcoming these new trends in fashion and the rational fashion education system, our team of researchers and experts have segmented 10 promising fashion colleges that are present today. 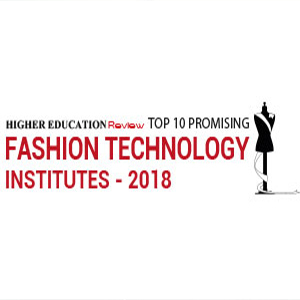 After careful research by our experts and researchers, based on the variables like infrastructure, industry exposure and education system, we at The Higher Education Review, in this edition bring to you the “Top 10 Promising Fashion Technology Colleges”. In the next pages, you will get some mind-boggling information about present day fashion education. Indian Institute of Fashion Technology Bengaluru, Karnataka A leading fashion-designing institute in India, IIFT trains the students to cope up with the growing challenges of the fashion scene and stay one-step ahead of the market requirements. Indian School of Design & Innovation Mumbai, Maharashtra Committed to a new model of cutting-edge design and innovation education, integrated with commercialization of design, ISDI brings about an Indianization of global innovations while working out a global perspective to Indian innovations. Institute of Design Chennai, Tamil Nadu With an alumni strength of over 10,000 graduates, the institute offers varied career oriented courses in fashion technology to meet the demand of South India's niche market. Madras Institute of Fashion Technology Chennai, Tamil Nadu One of the renowned institutes established in the capital state of Tamil Nadu holds the vision of producing qualified designers to drive the world of fashion towards success. Mumbai School of Design (Mod'Art India) Mumbai, Maharashtra Completed 10 years of journey as a Design School, MSOD now accommodates a lot more design programs than just the fashion program, to meet the rising demands of the industry and fast growing number of student applications. Nirmala Niketan College of Polytechnic Mumbai, Maharashtra One of the leading interdisciplinary, industry-centric design institutes in the country, the college thrives on its network of promoters and supporters, offering its students a gamut of work opportunities and industry experience. The Design Village Noida, Delhi One of the leading interdisciplinary, industry-centric design institutes in the country, the college thrives on its network of promoters and supporters, offering its students a gamut of work opportunities and industry experience.